Peggy is drawn to the synergy when playing, the connections with people, and the teamwork when performing. Kumi-daiko is an ensemble of taiko, and that magic of percussion, rhythm, music, and movement create a beautiful opportunity to bring people together. 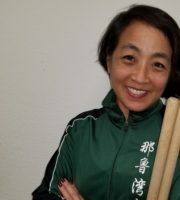 Peggy is fortunate to fill her life with teaching by day and drumming at night.